Boredom in pet birds, especially in parrots, contributes to an array of issues that extend from social complications into the realms of behavioral and physical health problems. Birds are extremely smart and emotionally sensitive. Some parrot species are even able to demonstrate the reasoning skills of a 5 year old child. While keeping such intelligent creatures constantly occupied seems like an almost impossible task, there is a way that it can by done by remembering a few simple steps. Read on to discover how easy it is to keep your bird mentally stimulated without driving yourself crazy in the process! Taking a few minutes out of each day to hold and handle your bird can provide immense positive mental stimulation to your feathered friend. 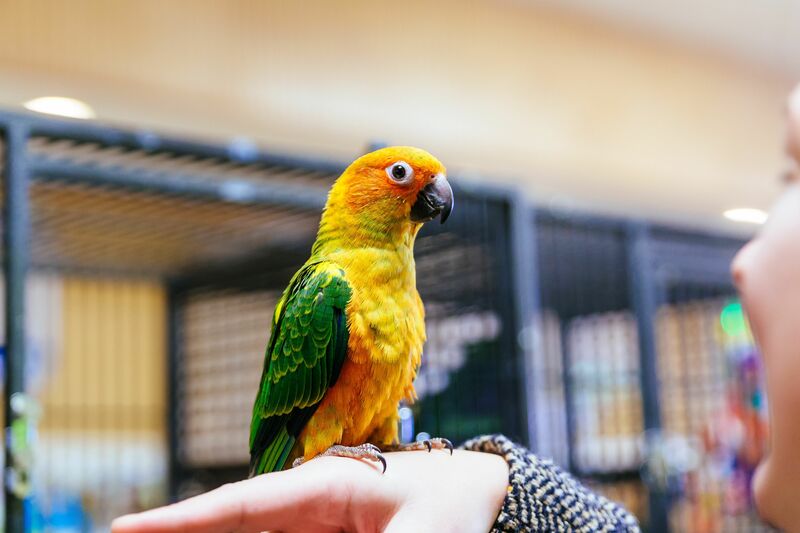 Not only do most tame pet birds enjoy physical contact from their owners, handling your bird every day will help you become more familiar with your bird's anatomy, and give you the upper hand on discovering any physical abnormalities that could signal illness or injury as a result. Handling your bird often also helps develop and maintain the bond that you have with your pet. Ask any bird owner -- the happiest parrots are those who get to spend the most time with their people. Much like young children, birds get bored playing with the same old toys after a while. Because bird toys can be so pricey, many bird owners opt to keep a stash of several different types of toys and rotate different ones in and out of their bird's cage every couple of weeks. This way, your bird will get to play with "new" toys every now and then, which will help keep him mentally occupied. You can even make a quick batch of fun homemade bird toys to offer even more variety to your feathered friend. One of the best ways to prevent boredom in your parrot is to teach your bird some fun tricks. The time that you'll spend working with your bird, plus the tasty treats that he or she will get as a reward for a job well done, will provide plenty of stimulation for your pet while at the same time offering tons of socialization time and strengthening the bird/owner bond. As your bird progresses, you can always add new tricks to help keep the process fresh. An added bonus is that you'll have a great time showing off how cute and smart your pet is for your friends and family! Play some music or a video. Many bird owners play music or videos for their pets when they are away from home or otherwise unable to spend time with their birds during the day. Birds are naturally interested in different sounds and noises, so leaving a radio or television on is a great way to keep them happy and comfortable while they are spending time in their cages. You can even log the types of music that your bird responds to the most or check out some of these popular songs about birds to make a custom playlist for your feathered friend. Offer your pet a variety of food options. In the wild, parrots dine on an array of different fruits, vegetables, seeds, berries, and nuts. It's no wonder that they tend to get bored in captivity eating the same old pellets and seed mix day after day. Aside from keeping your bird happy and occupied, adding more variety to your bird's diet in the form of fresh fruits and vegetables can give your bird's body a healthy boost of vitamins and nutrients. For extra fun and expanded options, try cooking up some homemade bird treats in your own kitchen and offering them to your pet. What Supplies Should You Have When Bringing Home a Pet Bird?